In the words of Defense Secretary James Mattis, the war on ISIS has shifted into the “annihilation” phase. While there is broad consensus for aggressively pursuing the terrorist group, the legal grounds upon which the president can expand the use of military force against ISIS are more tenuous. In recent years, the executive branch has justified its actions by pointing to the Authorization for Use of Military Force (AUMF), legislation relating to the attacks on September 11, 2001 that were signed into law days later – before ISIS even existed. Calls to update or replace the legislation have been unsuccessful. Is Congress abdicating its authority to authorize wars to the executive branch? What are the practical implications of this situation? Does the start of a new administration in Washington provide an opportunity to update the AUMF? 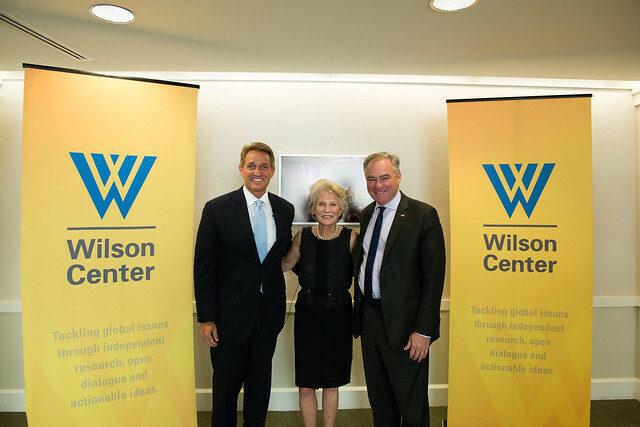 Senators Jeff Flake (R-Arizona) and Tim Kaine (D-Virginia) addressed these issues and more in conversation with Wilson Center President Jane Harman. "When I voted for [the AUMF in 2001], I never imagined that it would still be in force sixteen years later and applied [to] whatever military activities we undertake in the greater Middle East." "Of those in the House today... 300 out of 435 have never voted on a war authorization – and yet we continue to have war activities. That's simply not right. In the Senate... 77 have never voted on a war authorization." "People want to make sure - particularly those who have a connection to those serving in the military – they want to know that our adversaries and our allies and the troops know that we speak with one voice. When Congress works with the administration on this, it's better. Our foreign policy is better when it's bipartisan." "I think the onus is on the president to come to Congress and say, 'Alright, here is an associated force, here's what they're doing in this specific country' – but Congress is then required to act." "Any administration that is undertaking current activity in any country is going to be reluctant to propose an AUMF and come forward because the failure of that seems to indicate that they realize that they may not have the legal basis to move forward with what they're doing." "Some of the problem of not voting on a new authorization is, frankly, lack of backbone in Congress. That's a big chunk of the problem. If you can get away with not casting a war vote, which, by definition, should the hardest vote you'll cast; it should be harder than any other vote... and blame the President [for the war]... you might want to avoid [casting that vote]." "When we think about war, we usually think about states. Almost all of our doctrines and thinking about wars are wars involving states... When you think about a war against states, you don't have to define the geography, [as] the geography tends to be sort of self-obvious.... But we're in a different kind of world right now." "The reality of non-state actors using violence to achieve their ends is not just a temporary phenomenon anymore. I think we have to grapple with the fact that it's going to be with us for a while. Whether it's al-Qaeda, ISIS, the Taliban, or the Sinaloa cartel, or Boko Haram, or the Lord's Resistance Army, non-state actors... have a huge throw-weight in the world of the 21st century, but a lot of our doctrines don't really take that into account." "We have a contingency plan for everything, but try to explain it as part of an overall strategy rather than just a laundry list of a million contingency plans. That's where we're sort of weak right now." "In the [new bill proposed by Senators Flake and Kaine], we've tried to make it a little more of a template – not just authorizing action against ISIS, but thinking about what it is to authorize action against non-state actors as fundamentally a little bit different than state actors." "I think the magnitude of this abdication [by Congress] becomes more and more apparent to the public. You've got Trump administration officials – General Dunford and Secretary Mattis – saying, 'You ought to do this...' That shows there's an increasing sense of unease and disquiet and the status quo; we're standing on really shaky ground right now." "There is a message that is sent from a Congressional debate and vote in full view of the public that is not just an internal message; it's also an external message to allies and adversaries that's important to send."